Arsenal fans has grown tired of long serving club manager, Arsene Wenger who has been at the club since 1996. Fans are tired of results produced by Wenger's management over the years. 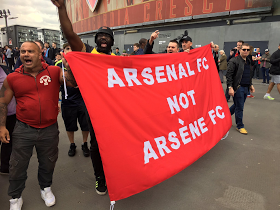 They protested before and after the match with Manchester city at the Emirates stadium on Sunday. Just before the second leg of the UEFA champions league match between Bayern Munich, fans also gathered to protest against the French man. 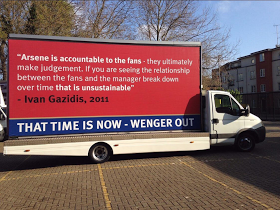 1 Response to "Arsenal Fans Hires Big Vans To Protest Against Arsene Wenger With Placards(photos)"